A Wounded Child In Aleppo, Silent And Still, Shocks The World : The Two-Way Opposition activists in Syria released a video showing a child in the back of an ambulance. 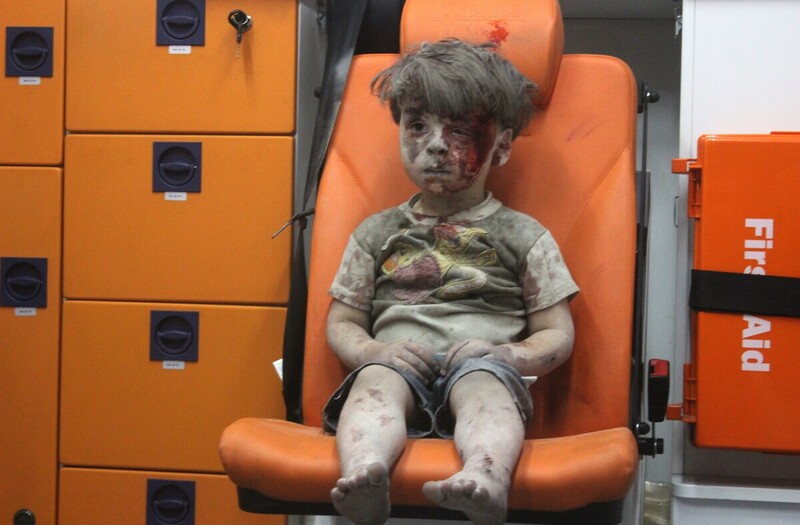 The haunting image — of a quiet boy, covered in blood and dust — has captured global attention. A 5-year-old boy, identified in news reports as Omran Daqneesh, sits in an ambulance Wednesday after reportedly being pulled out of a building hit by an airstrike in Aleppo, Syria. Medical facilities in Syria are routinely hit by government forces. As a result, hospitals have been pushed underground and use code names, such as M10. He had a head injury but no brain damage and was treated at the hospital then released, al-Ezz, the doctor, told the AP. Mohamad Al Ahmed Aburajab, a nurse who took care of the boy, tells NPR, "His blood pressure was very low. ... We took care of the wound and stitched it. ... Omran was not speaking at all ... [but] after about two hours, [he] was back to normal and we thank God." The rest of his family reportedly was rescued — his mother, his father and his siblings, ages 1, 6 and 11. They all escaped major injury. The Syrian Civil Defense — the volunteer lifesaving organization commonly known as the White Helmets — saved the family's life. NPR's Noor Wazwaz contributed to this story. A Viral Syrian Moment: Will It Be Different This Time?